With each of these characters there is a well-suited exhortation. As a son, Timothy is exhorted to be strong in grace. Grace goes with sonship, just as law goes with servitude - as we learn from Galatians. Then, as a soldier, Timothy is exhorted to endure hardness and to avoid worldly entanglements; these are right elements of good soldiership. As a vessel, he is to be cleansed, separated; as a servant, gentle, patient, meek; and so of each of these seven aspects of his life as a Christian. In 2 Timothy 15 he is told what is required of him as a workman: "Study to show thyself approved unto God, a workman that needeth not to be ashamed, rightly dividing the word of truth." The Word of truth, then, has right divisions, and it must be evident that, as one cannot be "a workman that needeth not to be ashamed" without observing them, so any study of that Word which ignores those divisions must be in large measure profitless and confusing. Many Christians freely confess that they find the study of the Bible weary work. More find it so, who are ashamed to make the confession. 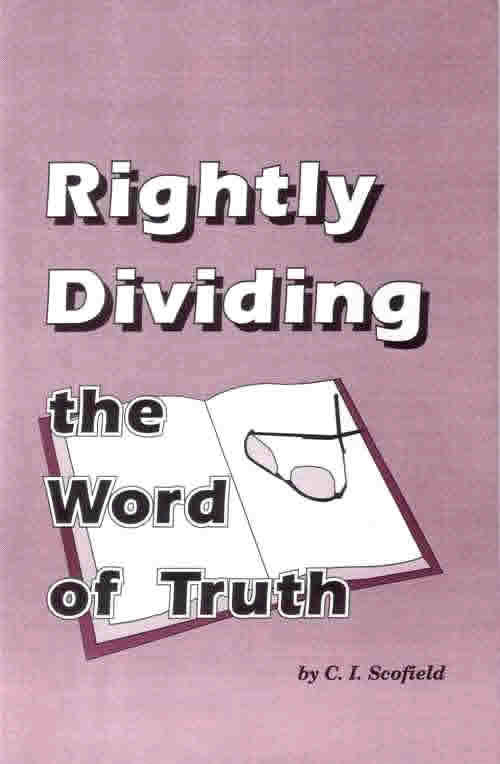 The purpose of this pamphlet is to indicate the more important divisions of the Word of truth. That this could not be fully done short of a complete analysis of the Bible is, of course, evident. But it is believed that enough is given to enable the diligent student to perceive the greater outlines of truth and something of the ordered beauty and symmetry of that Word of God which, to the natural mind, seems a mere confusion of inharmonious and conflicting ideas. The student is earnestly exhorted not to receive a single doctrine upon the authority of this book, but, like the noble Bereans (Acts 17: 11), to search the Scriptures daily whether these things are so. No appeal is made to human authority. "The anointing which ye have received of him abideth in you, and ye need not that any man teach you" (1. John 2:27).